The model TR-34 is a blend between our previous two models TR-3 and TR-4. The TR-34 with Brackett universal head assemblies has the capability of fitting onto most aircraft from the Cessna 150 up through King Airs, etc. with a published gross weight of under 14,000 lbs. Our biggest selling universal tow bar, the TR-34 is available in four different tongue configurations. 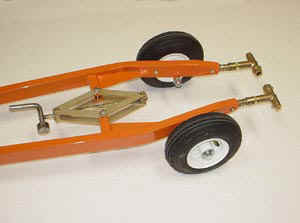 Wheels are also available for moving the tow bar to and from the aircraft. NOTE: The piper manual states that the tow pins are for hand towing. 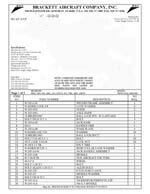 For powered towing we suggest our adapter set P/N T-P228A. 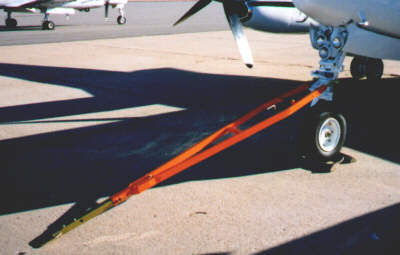 For Cessnas with wheel pants installed use adapter set P/N T-N182A to prevent scratching.